Bloxwich Remembers – for the fallen | The Bloxwich Telegraph – incorporating The Bloxidge Tallygraph and Walsall North News. Founded 2006. In Bloxwich today, Remembrance Sunday combined with Armistice Day, and hundreds of residents of Bloxwich, Blakenall Heath and Leamore gathered in glorious but decidedly chilly November sunshine for the annual observation of the nation’s traditional act of remembrance and to see the village’s traditional parade to honour fallen UK servicemen and women of all wars and conflicts, especially the Great War and the Second World War. Participants in the parade assembled outside the former Bull’s Head pub in Park Road and, the road having been closed by police, marched off at 10.20am, led by the Walsall Coronets band, along High Street to the War Memorial on the corner of High Street and Elmore Green Road where large crowds of local folk were gathered for a service of Remembrance around 10.40am. Veterans and their representatives arrive at Bloxwich War Memorial. 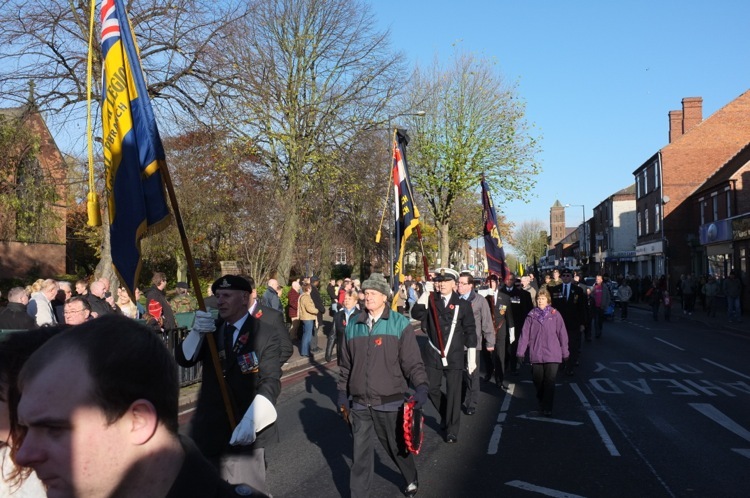 Local veterans and cadets marched proudly behind the standards of the Royal British Legion and other ex-services organisations, and were followed by youth groups including Bloxwich Army Cadets, Scouts, Guides and Brownies, representatives of local organisations, and local councillors. Reading the Bloxwich, Blakenall Heath and Leamore Roll of Honour. The people of Bloxwich and district were welcomed by Revd. Phil Hoar of St. John’s Methodist Church, who together with the Revd. Monica Arnold, Curate of All Saints Church and Licensed Reader Margaret Wootton (also of All Saints) read out the Bloxwich and district Roll of Honour for the Great War and the Second World War. Preceded by bells from All Saints Church, The Last Post was played to herald the traditional two minutes silence at 11am, with standards lowered by both veterans and youth groups (though sadly Drum Sergeant Alf Cooper, Staffordshire Regiment (retired) was unable to attend to sound the bugle in person this year, due to ill health). Mr Witton of the Royal Naval Association read the traditional Ode of Remembrance from ‘For the Fallen’ by Laurence Binyon. Mr Witton from the Bloxwich Branch of the Royal Naval Association reads from ‘For the Fallen’. Revd Phil Hoar subsequently led those assembled in prayer, readings and hymns to both honour the fallen and to pray for future peace, including a particularly poignant reading about the examples set in 2009 by a young soldier in Afghanistan and by the late Harry Patch, ‘the last fighting Tommy’. Jassica Castillo-Burley leads the singing of the National Anthem. The service concluded with the National Anthem with singing led by All Saints’ Church Youth Choir leader Jassica Castillo-Burley and the laying of wreaths by local dignitaries, Mr Witton laying the first wreath, followed by Roy Aldridge of SSAFA Forces Help West Midlands North Branch (Walsall District) then Bloxwich councilors and representatives of the armed and civilian services and other organisations. Individuals, including many youngsters, then proudly placed small crosses and poppies for fallen relatives and friends. At the final conclusion of ceremonies, the parade returned smartly along High Street to its point of origin, the Bull’s Head, before breaking up for another year. Army Cadets step out smartly on the return parade. The Rotary Club of Bloxwich Phoenix representatives. Bloxwich Scouts did their duty proudly on parade, as did the Guides, Cubs, Brownies etc. This year’s poignant, reflective but uplifting event was again very well supported, with an excellent turnout, and onlookers were once again particularly impressed by the large number of young people who proudly joined the veterans in the parade, notably smartly turned-out army cadets and other youth groups carrying flags including Bloxwich Scouts, Cubs, Brownies and Guides amongst them. Other local groups were represented, including the Royal British Legion, Rotary Club of Bloxwich Phoenix, Bloxwich Fire Station, Bloxwich Police and more. All photographs by Stuart Williams. Many more photographs were taken of this event than it is possible to show here. See also REMEMBERING HAROLD PARRY.